Click above to see a larger version on my SmugMug site please! 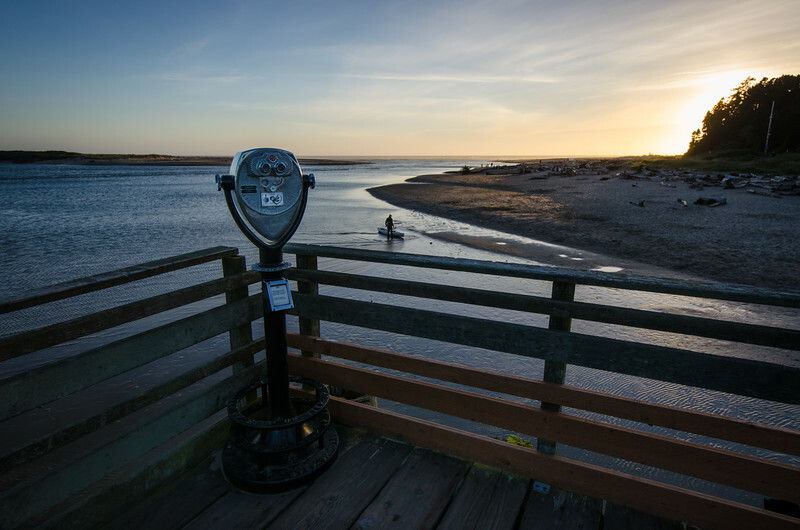 Sunset over Siletz Bay, taken earlier this month on my sojourn to Oregon. I have a few other photos taken the same evening, but (for now) I like this one best as it combines all the elements into one image: the sunset, deep blue water, sand, pier, viewfinder and kayaker. Camera & Settings: Nikon D5100, Nikon DX 10-24 lens at 14mm, 1/320 shutter, f/8, ISO 200. Handheld camera and shot in RAW and processed in Lightroom 4. I used the onOne "Graduated ND .5 stop" preset, added some vignetting as well as a few other adjustments to bring out some detail in the shadows. Here is my SmugMug homepage. Pick your poison and follow me on Twitter, Facebook and/or Google+. Related posts you may dig: Oregon light houses, Oregon coast near Gold Beach and Common murres at Yaquina Head. The above photo is ©Steve Hymon and may not be used on the internet or elsewhere without my advanced written permission. All rights reserved.